Town of almost 23,000 inhabitants at the north-western corner of Balaton. One of the largest cities of Balaton shore, traditional cultural and educational centre, university town. Currently it is one of the most popular places of Balaton visited by lots of tourists, probably because of its nice old city, historic monuments, museums, cultural programmes and the closeness of Hévíz. In the 4th century, at the time of the rule of Constantinus II, a large fortress was built by the Romans on the territory of the current Fenékpuszta. Junction of commercial and military roads was protected by the fortress. In the centuries of the great invasions the Huns, Eastern Goths, Longobards and then the Avars took the place of the Roman legions. 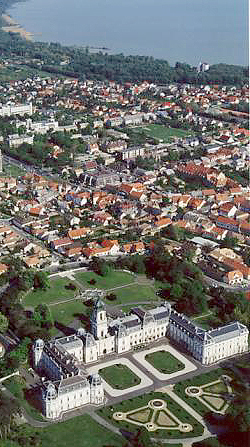 In the Árpád age Keszthely was a royal village ("villa regia") while in a document dated 1421 it is mentioned as a country-town. At the time of the Turkish rule the nunnery and church located in the heart of the city were reconstructed into a fortress. At the beginning of the 18th century Keszthely got under the ownership of the Festetics family. In 1745 they built a pompous castle and replaced the centre of their domains here. A hospital was established by Kristóf Festetics in 1759, and a high-school by Pál Festetics in 1772 in the town. Georgikon, the first high-level agricultural institute of Europe was established in 1797 by Count György Festetics; the institute first educated professionals only for the domain but soon it became of national significance. The Helikon Ceremony of Literature first organized in 1817 has become a tradition by now. Major buildings of the main square of the city are the Gothic parish church and the high-school in its neighbourhood. The church was built for the Franciscan order settled here, it was used already in 1386. Gothic paintings of the largest surface in Hungary can be studied near the sanctuary of this Gothic church. After the Turkish rule the church was renovated in Baroque style, its neo-Gothic tower was built in the 1880s. Sculpture of The Holy Trinity in the square was erected in 1770. Characteristic buildings of the promenade starting from Fő square to the north were constructed in the second half of the last century. Composer Károly Goldmark was born in house No. 22 of the promenade (it is the oldest building of Keszthely) in 1830. Synagogue in the yard of the building with arcades (Jewish house of prayer on its place already in 1769). Promenade leads to the entrance of Festetics Castle. This wonderful Baroque building is the third largest castle of the country, it is a real aristocratical palace with 101 rooms; Helikon Castle Museum inside the palace. Large library room with original furniture completed in 1801 in the southern wing of the building. Number of books exceeding 86,000. Besides the pompous library room, 16 other rooms are furnished with period furniture. Concerts of national fame in the former dining-room, the most beautiful weapons of the National Museum in the corridor leading to the dining-room. Windischgratz collection of trophies in a separate room. Park of the palace is under protection because of the various plant curiosities. Manor Museum established from the former educational manor of Georgikon in Bercsényi street. Beyond the history of the Hungarian high-education of agriculture, collection of cultivation of cereals and viticulture, cartwright's and smith's workshop and exhibition of coaches therein. Leaving Fő tér southwards we can get to the neo-baroque building of Balaton Museum handed over in 1928. History of surroundings of Balaton, plants and animals of the lake, museum of Roman and mediaeval stonework finds in the Museum. Works of painter János Halápy in one room of the building. Helikon monument in the nice park westward to the railway station commemorates the age of former poets' meetings and games. Promenade in park lined with the sculptures of famous persons relating to the town leads to the shore, to the harbour. Programmes of summer season in Keszthely start already at the end of April with Helikon Ceremony. Opening of Summer Season is followed by the programmes of Balaton Festival in May. Classical music programmes of Festetics Palace are of national fame, beyond solo evenings and concerts of chamber-music, master courses are held there, too. The programme called Summer Theatre of Keszthely is held in July and August in the park of the palace. The Wine Festival in August attracts many visitors. In the Pantheon in the Promenade you can find plaques commemorating the famous figures and events related with Keszthely. In the city centre you can find the Doll Museum and the Marchpane Museum. Pleasant promenade to Lake Hévíz, the largest and most famous warm-water lake of Europe. Castle of Rezi in the neighbourhood of the city is also worth visiting. It is situated about 5 km from Keszthely, along main road No. 71. The shortest road connecting Aquincum and the mother country, Italy, ran through the present-day Székesfehérvár, Veszprém, Tapolca to Veszprém, where, at Fenékpuszta it crossed Lake Balaton, which was bigger at that time. To provide protection for the important road, veterans, ex-servicemen were settled here in the territory of Keszthely. The increase of the population was probably related with the building of the Roman fortress, which was the largest building of the territory. There used to be a settlement on its site. The inhhabitants of the fortress of Fenékpuszta did not escape, their life was undisturbed until the middle of the 5th century, though the region belonged to the Hunnish empire from 433. After Attilas death (456) the German tribes occupied the region. The buildings of the fortress are still under the ground, only three of its remains can be seen: the southern gate, the one-time basilica and a store-house. The buildings of the Festetics manor were erected around 1820 in neoclassical style. The stud-farm of the Festetics family became very famous. Poet Sándor Petőfis wife, Júlia Szendrey was born in Újmajor in 1828. Her father was the steward of the Festetics estates. A memorial plaque was placed on her house of birth in 1909.